(also called TRON, TROND, TRUDON, TRUTJEN, TRUYEN). Apostle of Hasbein in Brabant; died 698 (or perhaps 693). Feast 23 November. 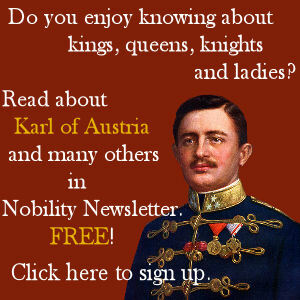 He was the son of Blessed Adela of the family of the dukes of Austrasia. Devoted from his earliest youth to the service of God, Trudo came to St. Remaclus, Bishop of Liège (Acta SS., I Sept., 678) and was sent by him to Chlordulph, Bishop of Metz. Here he received his education at the Church of St. Stephen, to which he always showed a strong affection and donated his later foundation. After his ordination he returned to his native district, preached the Gospel, and built a church at Sarchinium, on the River Cylindria. 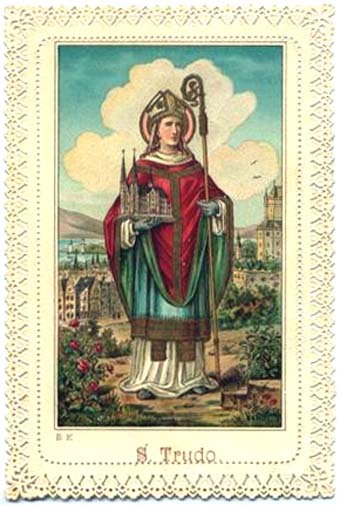 It was blessed about 656 by St. Theodard, Bishop of Liège, in honour of Sts. Quintinus and Remigius. Disciples gathered about him and in course of time the abbey arose. The convent for women, established by him at Odeghem near Bruges, later also bore his name (“Gallia Christiana”, Paris, 1887, V, 281). After death he was buried in the church erected by himself. A translation of his relics, together with those of St. Eucherius, Bishop of Orleans, who had died there in exile in 743, was made in 880 by Bishop France of Liège. On account of the threatened inroads of the Normans the relics were later hidden in a subterranean crypt. After the great conflagration of 1085 they were lost, but again discovered in 1169, and on 11 Aug. of that year an official recognition and translation was made by Bishop Rudolph III. On account of these translations the dates 5 and 12 Aug. and 1 and 2 Sept. are noted in the martyrologies. The “Analecta Bollandiana” (V, 305) give an old office of the saint in verse. The life was written by Donatus, a deacon of Metz, at the order of his bishop, Angibram (769-91). It was rewritten by Theodoric, Abbot of St-Trond (d. 1107). BUTLER, Lives of the Saints; WATTENBACH, Geschichtsquellen, Deutschl., I (Berlin, 1873), 146; HAUCK, Kirchengeschichte Deutschl., I (Leipzig, 1904), 306; FRIEDRICH, Kirchengeschichte Deutschl., II (Bamberg, 1869), 347; STADLER, Heiligenlexicon; Bulletin de la societe d’art et d’histoire du diocese de Lieuve, XIV (1904), 251; MABILLON, Acta SS. O.S.B., II, 1022.